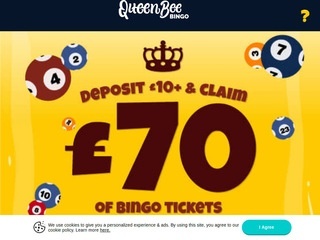 Queen Bee Bingo Casino will then reward you with a bonus (Welcome Bonus is for new players only). The terms and conditions of the bonuses vary between different casinos and might also change over time and between different countries, so it is important to compare the different offers and read the T&C for Queen Bee Bingo Casino before signing up. 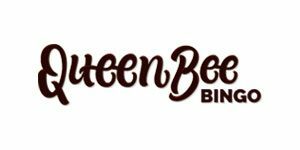 One of the new entrants to the e-gaming industry is Queen Bee Bingo has become popular with its features and the welcome bonus offer. Though the layout of the website does not display any queen bees flying as the name suggests, the exceptional graphics and the eye-catching layout could attract many players interested in playing the slots games and bingo. The Government of Gibraltar issued the license and therefore, the casino operates under the regulations of Gibraltar Gaming Commissioner. The 888 group, which is the parent organization, has obtained the license from the Great Britan Gambling Commission. The software developed by Dragonfish ensures that the games run very smoothly while the player is enjoying the fun. Unless you are looking for a wide choice of game variants, the limited basic variants of 90-ball, 75-ball and High 5 bingo games would satisfy the mediocre player. The popular games include Street Play, Last Call besides some free Bingo rooms. As a compensation of the Bingo section, probably the game show theme slots or the wield slots would spoil you while you start paying the games. The more popular games like the Sharkando, Cleopatra, Starburst, Oil Mania, Da Vinci Diamonds etc would keep your amusement at an optimum level. The high level of encryption of data ensures that the info is protected and no risk from the fraudsters to hijack the data. Similarly, the Random Numbering Generator authenticates the fairness of games you play on the casino. Though you can browse through the games from any portable devices and Tablets, there is no dedicated mobile app either for Android or iOS operating systems. But for this, the Queen Bee Bingo mobile games are player-friendly in navigation too.